TSWREIS Recruitment 2019 for Telangana Gurukul Teacher Recruitment Notification 2019 announced for 5334 vacancies, TSPSC Gurukul Notification announced for Social welfare, Tribal Welfare, BC welfare, Minoraty Welfare and Telangana Gurukula Teacher posts, TS Gurukul Recruitment 2018 Online Application at https://tspsc.gov.in…. Government of Telangana is going to announce the state Residential Educational Institution Societies (Gurukulam) schools teacher’s vacancies recruitment notification for filling totally 5334 posts in TSWREIS through the state public service commission of TSPSC, and the state education department has announced the TS Gurukul Recruitment 2019 notification announced on 15th or 18th June 2019 respectively. According to the reports, this TSPSC Gurukul Teacher Recruitment 2019 has major changes in scheme of examination, previously those gurukul teacher posts recruitment selections has conducted based on Mains, Prelims and interview. Now this TSPSC gurukul teacher recruitment 2019 has conducted with 3 papers of Paper-1, paper-2 and paper-3 and the candidate who have qualified on those 3 papers and who has their TET score they will get teacher post under TS Gurukul Teacher post in the state SC, ST, BC and Minority Residential Schools across in the state. 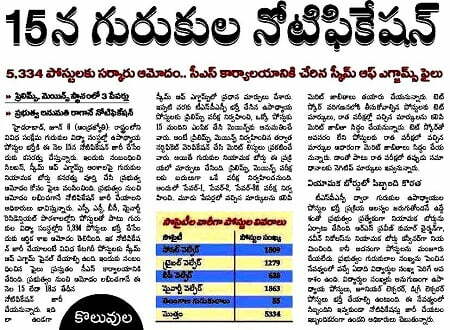 department of Education, Telangana State has going to announce the state (TSWREIS) residential society schools vacancies in categories wise and society wise for all TS Residential schools in the state. All the TET eligibility candidates can apply to the Telangana State Residential Educational Institution Societies (TSWREIS) teacher posts recruitment, and post wise eligibility with reserved categories eligibility with complete details through TSPSC TSWREIS Teacher Recruitment 2019 official notification. Those eligible male and female candidates who have between 18 to 44 years of old, they can submit the TS gurukul teacher application online, and the reserved categories candidates will have age relaxation as per Telangana government rules. The TSPSC will announced the TS Gurukul Teacher Recruitment 2019 Online Application Fee through detailed notification, we have expected candidate can pay Rs.200/- for each application registration for all general and OBC candidates.